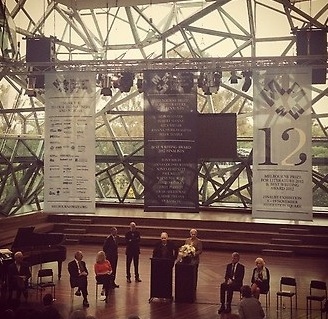 The Melbourne Prize for Literature awards were announced at Federation Square tonight. Congratulations to Craig Sherborne for winning the Best Writing Award, and to Alex Miller for winning the Melbourne Prize for Literature. Craig Sherborne is the author of The Amateur Science of Love – see my review and a Sensational Snippet. Alex Miller is the author of many books – see his profile at Meet an Aussie Author which has links to my reviews of many of his books, and also my review of his latest, Autumn Laing. I didn’t make it to the ceremony because I’ve torn a ligament in my ankle and am confined to barracks for a while so I am indebted to @Melbourne Prize for the news and the photo! Congratulations to all the winners, the nominees and their publishers, and thanks to the judges who had a very difficult job. Special thanks also go to the Melbourne Prize Trust, an initiative of the Committee for Melbourne, for their generosity.